As with other features of Moodle, there are many options relating to the quiz creation process which are outside the scope of a simple guide. The guide below covers the setting up of a simple quiz and a multiple choice question. 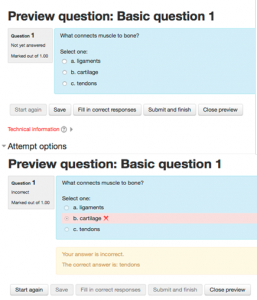 Creating a quiz in Moodle is a two stage process. You need to set up the Quiz and then add questions. 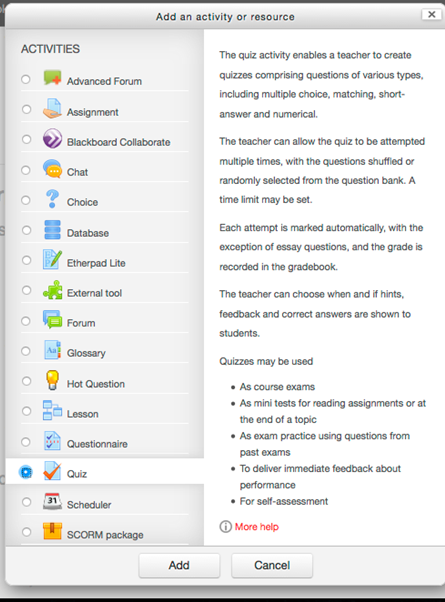 Click Add an activity or resource, scroll down through ACTIVITIES, select Quiz and Add. Give the quiz a meaningful Name and use the Description to explain clearly what the students have to do. There are many different settings available for quizzes but they can be revisited later if you are unsure at the initial stage what is required. The main options are described below. (For detailed information see Quiz settings on Moodle Docs or click the context sensitive help icon beside each option). 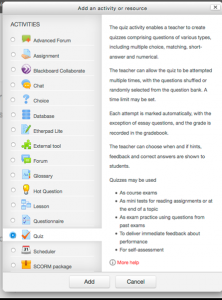 Timing – set an open time for the quiz using the Enable until you open a quiz the student cannot start. Set a Close time if required. After the closing time, students will not be able to start a new attempt. However, they will be able to continue an existing attempt. You can optionally choose a Time limit after which Moodle will automatically submit the quiz with answers completed to that point. In the absence of a time limit, students can take as long as they like. Grading Method – which grade of several attempts (highest, average etc.) is recorded. Attempts allowed – set the number of allowed attempts. Formative (self test) quizzes will usually allow students multiple attempts, summative (exam condition) quizzes only one. Choose the Question order i.e. whether to retain a fixed order or to shuffle the questions each time the quiz is taken. Shuffling is useful to prevent students copying from each other in exam settings. It is also useful for reinforcing learning when students are allowed multiple attempts. New page allows you to choose the number of questions per page. How questions behave provides a range of settings to control when/how feedback is displayed. The default deferred feedback is often the preferred option. This means students will take all questions and submit the quiz before getting any feedback. 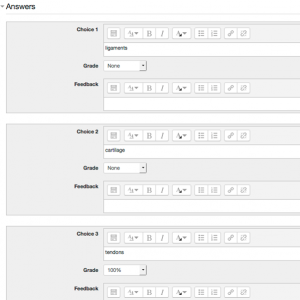 Review options – use these to control what students see in terms of feedback, marks, correct answer indication (and more) when they check previous attempts at a quiz and during an attempt if using adaptive mode. See Review options on Moodle Docs for more detail. Appearance – use this to determine use of decimal places in grades. Extra restrictions on attempts – an array of security options are available to control how quizzes are taken in exam settings. Overall Feedback – general feedback that students get at the end of the quiz. It can be tailored to grade boundaries if required. Common module settings – use this if you want to restrict access to specific groups. When you have finished, click Save and Return to course. You can now add questions. N.B. You are likely to need to revisit quiz settings before you run the quiz – to do so, click the quiz on the course page and select Edit settings in the ADMINISTRATION block. Click the quiz on the course page and Edit quiz. The next screen gives you various options including using the Question Bank. This is a store of questions in use already. If such questions exist, you can reuse them in a new quiz. Select Multiple choice (default) and Add. On the next screen, provide a Question name – the student doesn’t see this but use something that is unique and meaningful for organising quiz questions. Add the question stem to Question text. Scroll down to change the Default mark of 1 and add any General feedback if required. This is additional to specific feedback that can be provided for each answer. If used, it is displayed to all students regardless of their answer choice. 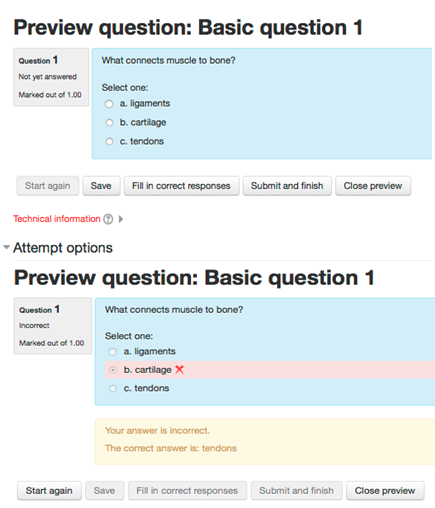 In the next section, use One or multiple answers to control whether one or more answer options are allowed. Leave Shuffle the choices selected, if the answer options should be shuffled each time the question is displayed. This is useful in exam situations where students might be tempted to look at someone else’s screen. However it is also useful if students are using the quiz formatively and viewing the questions repeatedly. Use Number the choices if you want other than the default ‘a, b, c’ for answer options. 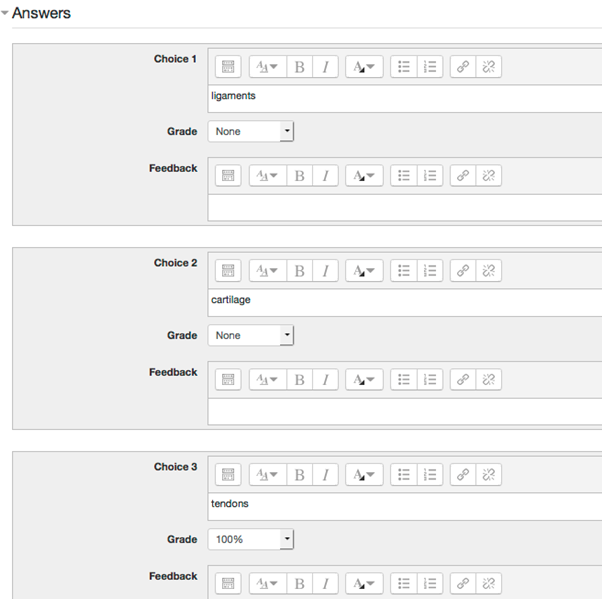 Then enter the answers, the grade and any specific feedback. In the example below, there is no feedback. This will result in automatic feedback depending on the grade i.e. the answer marked 100% will get a Correct message and the others Incorrect. The exact text of the automatic feedback is set in Combined feedback. Explore the other options but a simple question will not require them. As you proceed with question set up, you may want to regularly Save changes and continue editing. You may also want to Preview it to check it is working as required. Make any further changes as result of Preview then click Save change. You can then use Create a new question … to create further questions. 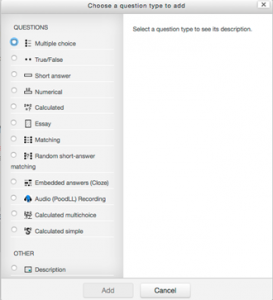 See Question types for Moodle quizzes for information on other question types. Once a quiz has been completed, follow the guidance to Review a Quiz before use prior toreleasing it to students. If you have hidden the quiz, Turn editing on and select Show on the Edit drop down. If you are using Timing, the quiz will be released on the chosen date. You can alter this via Quiz Administration/Edit settings if required. If you’re using other methods e.g. Restrict access make the necessary adjustment. Use Switch role to student to test availability.